Photos were ready, and I was about to upload them and write about my Wednesday in Yosemite, when something happened to my Internet connection at Yosemite Lodge. I blamed the Lodge system for the rest of the evening and things were still amok Thursday morning and I discovered Sister wasn't having any problems. From the symptoms, I was afraid I was having a hardware problem with my wifi card. Most of the "Troubleshooting" steps involved doing things that were beyond my control, so I just kept selecting "try something else," and at some point Facebook popped up, despite dialogue boxes to the contrary indicating that the problem was not solved. I love it that something worked, but frustrated that I have no clue why. Thus, I'm getting this up a day later than planned. We woke up to rain on Wednesday. I'm prepared. Sister is prepared. Sister-in-Law-M is prepared. Sister-in-Law-T, in the last minute rush to depart home, didn't put her winter jacket in the car, and relied on positive thinking to forestall the need for boots. I tromp through puddles when it rains, my rebellion against being a good little girl. Or maybe one that didn't have really waterproof boots for many years. 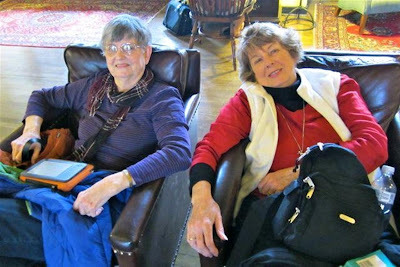 Sister and I were a bit late for breakfast, so much so that we entirely missed the SILs there until we rejoined them afterward to go to the Ahwahnee Hotel to meet Nephew and Nephew's Girl Friend for lunch. Apparently, after her own puddlely walk to breakfast, SIL-T had put her shoes on the heater to dry and now the soles had --um -- been cooked off. With much arm-twisting, SIL-M persuaded her Sister to wear her boots. Before we got to lunch, we had a mission en route to find SIL-T shoes at the very least and boots if we could convince her, in light of the snow forecast for the day. We weren't successful until our trip back to Yosemite Lodge after our interlude at the Ahwahnee. The Dining Room at the Ahwahnee awaits our arrival for luncheon. Do click to enlarge this for full effect! a powdering of snow on the Valley rim. By evening, just before dinner, it's outside our room. After which, the Internet went kaput, at least as far as I was concerned. Tomorrow I'll give you another meal at and a tour of the Ahwahnee. By the way, our tour guide said 8 to 12 inches of snow is predicted for Yosemite Valley on Friday. To use an old family expression, the trip home may have to go all around Robin Hood's Barn, rather than up over the usual route at 6200 feet (1900 meters). I'd love to hear whether anyone of you is familiar with that Robin Hood's Barn expression. See you when I get home! I've never been to Yosemite. It looks lovely. Here I am schlepping around Europe and there's still so much to see in my own country. Hey, getting snowed in is fun. Enjoy! What gorgeous pictures! The lodge and your food look amazing, and your party looks in good spirits despite rain and snow!